One of the things that’s really driven me nuts about the Elektron Octatrack MKI and MKII (aside from each track being monophonic) has been a workflow issue of managing tracks and parts. As you may know each bank allows for 4 “parts” to be allocated for up to 16 patterns. A part basically is a “preset” which allows you to set up samples on tracks and play them. You get a pile of slots, and there’s plenty of memory, but with only 4 parts one needs to get creative about how to make the most of them in order to prepare a performance. If you’re just working on a track, and don’t care about your other material then this will be no big whup for you, but for someone like me who’s attempting to set up a 3 hour + live set with a minimum amount of pre prepared gimmicks involved four parts is nowhere near enough. In a live set I will usually play 10-14 songs, and I could easily have all my parts used up by song four or five. Each song it it’s own thing, and needs several tracks (all of them) and so between songs I need a way to get all my tracks to play totally different samples (and yes each bank has a refresh on the part allocation, but I’d rather not hover over a groove box in the middle of a show, it’s amazing to me sometimes that I can even remember how to change patterns let alone want to be pulled from the moment to try to remember which bank what song is in. Dig?) In the olden days of rack mount midi samplers if you had enough memory, you could load up all the resources for a set, and then instantly call up the “preset” for your song and go… but this is cumbersome, and challenging to find creative ways to extend the four parts and make to the very most of the Octatrack. A sample chain is basically that, a chain of samples all together in one file. “slice” them up in the octatrack and enable slice mode, and you can use P Locks or even midi CC info to determine which slice you’re going to play on any given hit in a pattern. This is actually a great idea, and it’s turned out to be very inspiring. The problem is that the hassle of creating a chain is a drag for sure, but then what happens when you want to add a new song to your set? Dude. You have to re create the whole thing, or open the old chain and tack new samples on to the end and then most likely you’ve demolished your sample data and have to go re create all your slices, and might even need to reprogram all your sequences. Heartbreaking and lame. 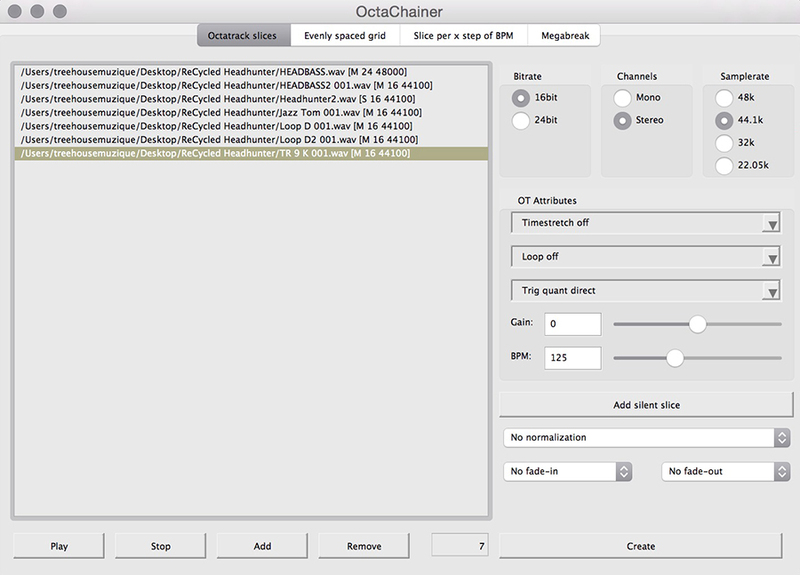 Norwegian duo Tic Tic have released some freeware called Octachainer. It’s a cross platform (Mac and PC) application and very simple to use – Open it up, load your samples, tell it what you want to do, and export your file. Then load that file into the Octatrack or Analog Rytm and slice it up and play. Just today I was adding new material to my set and I included the old chain with the new files, and exported it and only needed to add new slices to the end where the new files were and everything else was perfect. I don’t like working with audio and midi on the computer. That’s not my thing. But the mighty Octatrack, as lovely and fun as it is to use live, is a little obtuse when it comes to working with files, and banks and parts for setting things up. this software makes very quick work of a tedious task. I did Not know That. Thanks man! One can always get useful things & tips from you. Very Useful! Tytm user here !